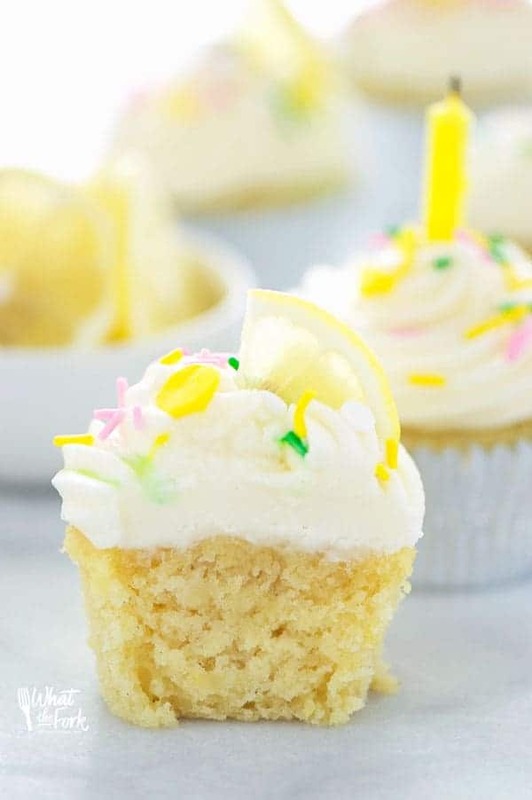 These gluten free lemon cupcakes have a tender crumb and are full of bright lemon flavor. Bonus – they’re really easy to make, no stand mixer required! It’s my birthday again! 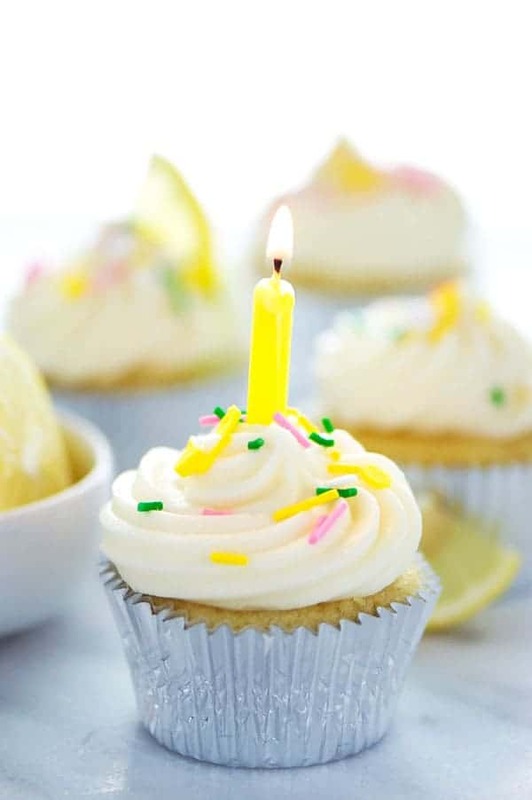 This year, instead of a cake, I decided to celebrate with these gluten free lemon cupcakes. 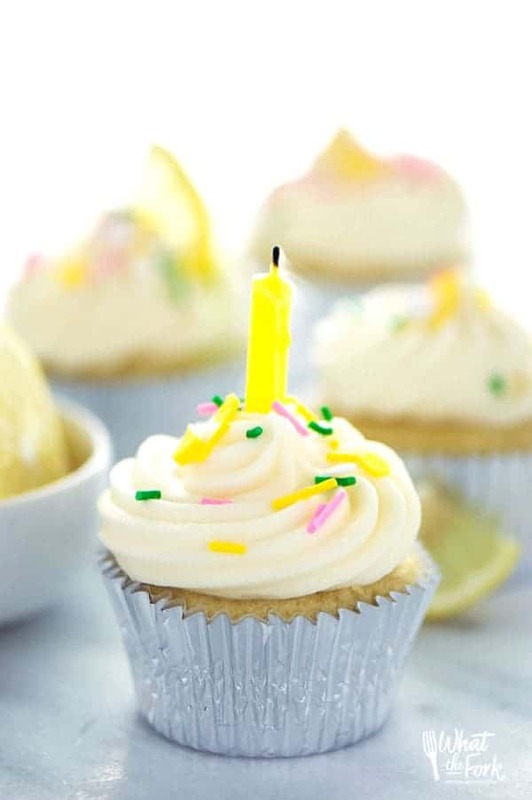 These cupcakes are so bright and fresh – perfect for birthdays! In the past, I’ve really done it up with birthday cakes. Last year, I made a gluten free coconut cake which was a big hit. The gluten free funfetti cake that I made the year before that was also a reader favorite. So why cupcakes this year instead of another gorgeous layer cake? No really, though… I’ve been working HARD and I just did NOT want to make a big, beautiful (read: time consuming) layer cake. And I’m not saying that making a cake is hard, it’s a little work. But when you’re recipe testing, it’s a lot. Several rounds of testing, plus making and styling it for photos AND making an extra one for videos – it’s just SO much cake. Basically, any get tother and any time I have to make or bring a dessert, I use that as an opportunity to test a recipe out. For this recipe, I was pretty happy with the way they came out the first time – plus I made them mini, which you could do here if you want. I only had to tweak a few things and BOOM: the best gluten free lemon cupcakes, ever! Since I happen to love fruity desserts too (sorry Adam), I thought this would be the perfect time to get this recipe down. And that I did – I don’t want to pay myself on the back but I’ll just go ahead and do that and say that I nailed it here. So much lemon flavor and the cupcakes have such a great texture. Lemon perfection! 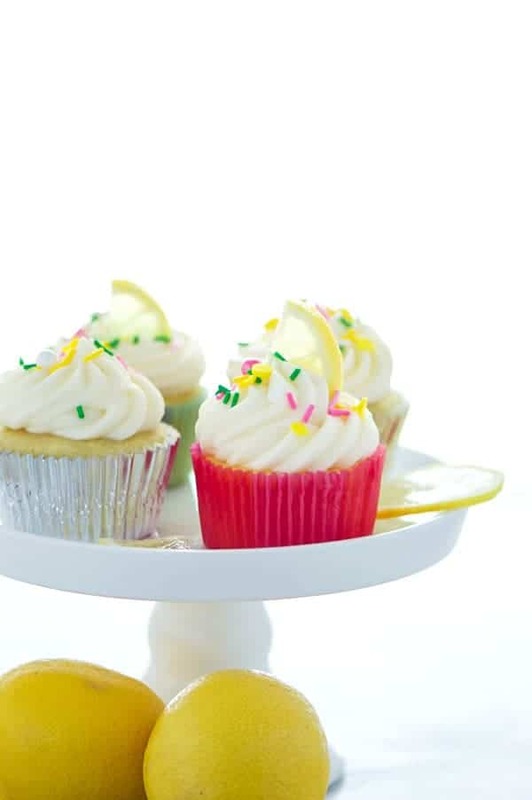 These lemon cupcakes get their bright lemon flavor from THREE sources of lemon flavor – fresh lemon juice, lemon zest, and a little bit of lemon extract (I use Rodelle lemon extract). That lemon extract gives these that little extra lemon flavor that you can’t get from just the juice and zest alone. It’s what truly makes these seem like a bakery-style cupcakes. If you REALLY want to up that lemon factor, you can scoop out some of the top of the cupcake and fill it with some of my paleo lemon curd. If I had some on hand, I probably would have done that! Since it’s my birthday, I teamed up with Rodelle to bring you guys another great giveaway! I can’t have a birthday and without having a little giveaway, right?! 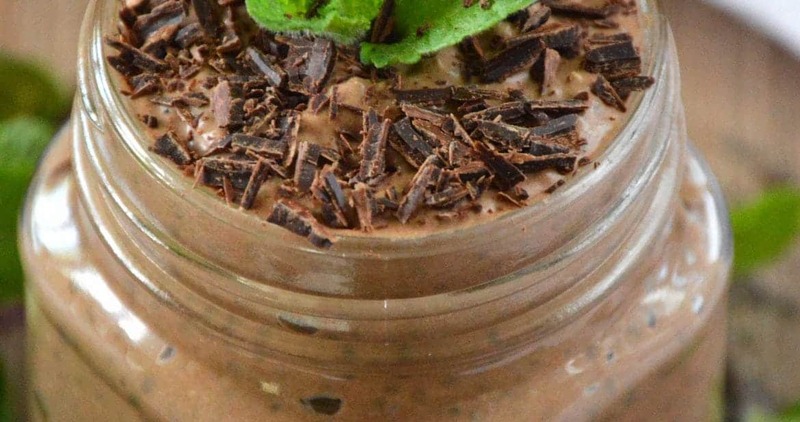 This time, we’re giving one of you a fun little sampler prize pack that includes some vanilla extract, lemon extract, almond extract, vanilla paste, and their gourmet baking cocoa. You can enter the giveaway via the giveaway form at the end of the post. Good Luck! Preheat oven to 350 degrees and muffin tins with 15 cupcake liners or spray well with non-stick spray. 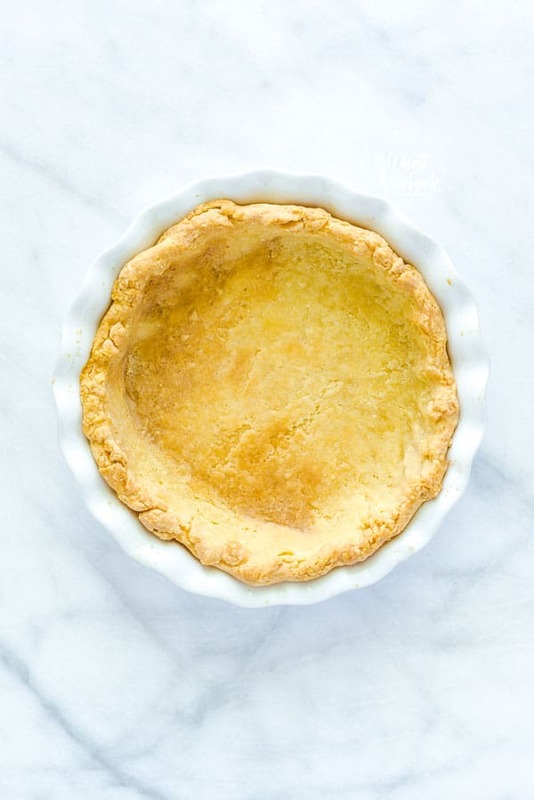 In a large bowl, whisk together the gluten free flour, xanthan gum, baking powder, salt, and sugar. Set aside. In a medium bowl, whisk together the eggs, lemon zest, lemon juice, lemon extract, vanilla extract, milk, and avocado oil. Pour the wet ingredients into the dry ingredients and stir until combined. Remove from the pans and cool completely on a wire rack before frosting. 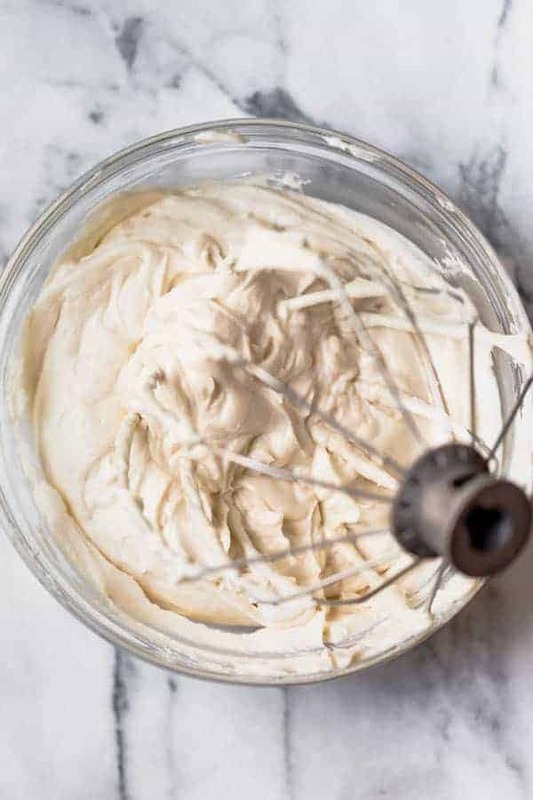 Add the cream cheese and butter to a bowl of a stand mixer fitted with the paddle attachment. Beat together until smooth, about 1 minute. Scrape down the sides of the bowl and add the powdered sugar and mix on the lowest speed until the sugar is incorporated. 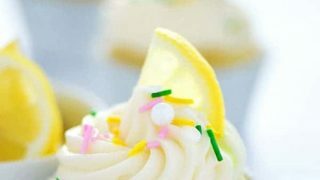 Add the vanilla and lemon juice and mix an additional 30 seconds to 1 minute until the frosting is smooth and creamy. Frost the cooled cupcakes as desired and store in the refrigerator. Bring to room temperature before serving. Cupcakes are best if eaten within 2-3 days. These cupcakes also freeze well. I use my Nightshade-Free Flour Blend for this recipe. I also tested this recipe with Bob’s Red Mill 1:1 Gluten Free Baking Flour with great results. For dairy free cupcakes, use unsweetened coconut milk in place of the whole milk and use the dairy free cream cheese frosting recipe found here. I used an Ateco 829 Open Star Tip to frost these cupcakes. If you use a large piping tip to frost the cupcakes, you may need to make an extra 1/2 batch of frosting. We made a Germen chocolate for my wife’s last birthday, and our kids usually just have a white or yellow cake with icing. YUM! 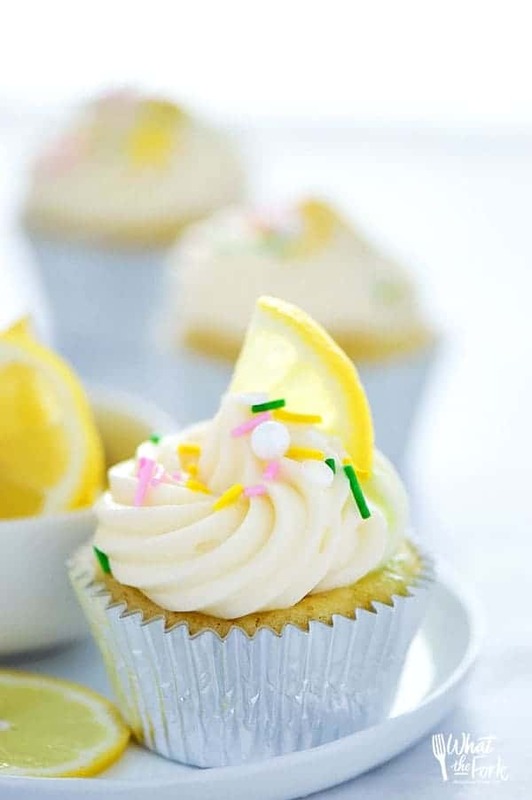 I love lemon cupcakes! 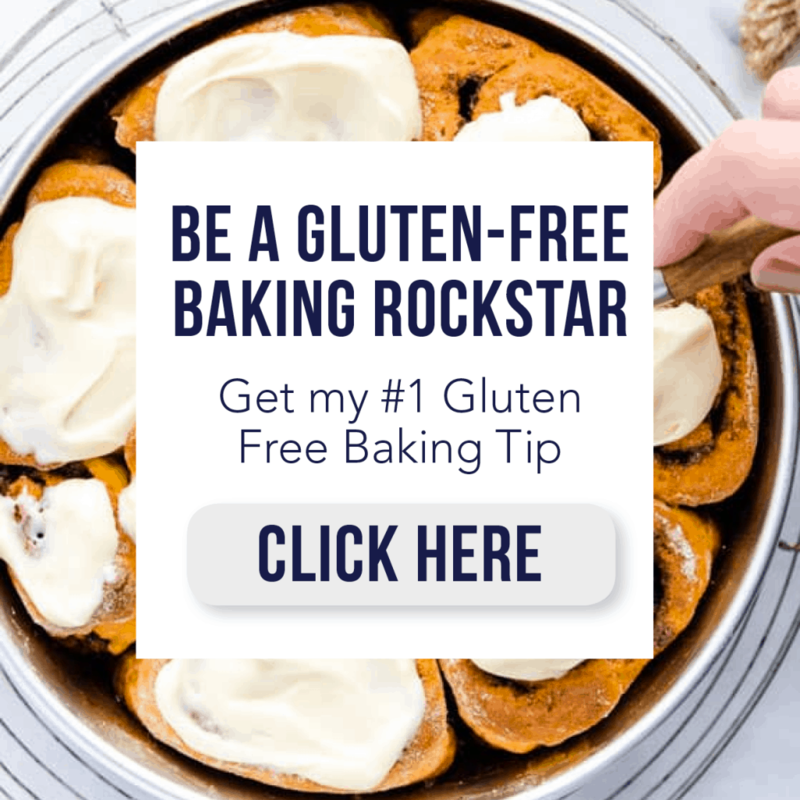 I have to let a few of my friends who are gluten free about this recipe! no cake for me on my last birthday. This really does look like the best lemon cupcake! As a lover of fruity desserts, too, I’d be SO into these! Those are the most beautiful lemon cupcakes I have ever seen! So bright and vibrant, and I’m intrigued that you used avocado oil! Thanks and CHEERS. I love baking with avocado oil! These look SO perfect Sharon! I can’t believe how tender that crumb seems and that lemony hue is gorgeous! Thanks for including a dairy-free option, too! Looks seriously amazing! We love lemon in our house. Pinning for later. Lemon flavored desserts are my favorite in the summer. These cupcakes a calling my name! They look absolutely perfect! I had my first gf cupcake recently and it was delicious! I had a lemon cake with vanilla frosting for my birthday. I’m sooo obsessed with lemon right now! These look great!! I celebrated with a white cake. These look amazing! I had a gluten free pumpkin muffin on my last birthday. I celebrated with an ice cream cake. Happy Birthday, and thanks for another great recipe. We all love lemon here, and I love your recipes. They are always easy to make and delicious. My last birthday cake was a chocolate and hazelnut layer cake with white chocolate mousse & raspberry layers, coated in a light whipped hazelnut mousse frosting. It’s actually my birthday cake every year.. a local bakery makes it and it is the stuff of dreams! My last cake was a vanilla cake with cream cheese frosting. Can you substitute a different oil for the avocado oil? You can use vegetable oil or canola oil. I haven’t tried this with melted coconut oil. I had an orange-pineapple cake for my last birthday. I made a home made cookies and cream cake for my last birthday. I made a vegan chocolate cake for my mother-in-law’s birthday. My birthday is in September, and can’t remember that long ago! This year I made a gluten free, egg free, lactose free cheesecake with strawberries! I have never tried vanilla bean paste, but I would love to try it. I just made these cupcakes – used all the ingredients you listed except the xantham gum because it was already in the Bob Red Mill’s 1:1 GF Baking Flour, and I used coconut sugar. The taste is great! But they were dense and didn’t rise much. Is there a way to make them more light and fluffy? Suggestions? Hi April, I think the coconut sugar may have been the culprit here. When I use it, I’ve noticed that I have to use more liquid (kind of like baking with coconut flour but not as much) or else the end result will be a little drier. Hi Sharon! I made these twice this last weekend. The first I followed all the ingredients, except the Xanthum Gum because my Cup4Cup had it. I subbed avocado oil for coconut oil but otherwise, followed the recipe and mine also came out very dense. Everyone loved them, except me. So, I tried it again, thought maybe if I used a different one to one, beat them longer to get more air into them, I used Bob’s this time, got the same exact dense result…any suggestions? Hi Janene, for starters, I wouldn’t over mix the batter. I’d also recommend making sure you’re measuring your flour correctly. Start by stirring your flour, then use a spoon to scoop it into your measuring cup and then level it off with a straight edge. Using even a little too much flour can make dense/drier gluten free baked goods. I doubled the recipe and turned it into a cake for Easter and it was SO GOOD. My mother in law keeps raving about it and based on the number of slices my father in has gone through I think it’s safe to say that he’s also a fan 🙂 Thanks Sharon! Hi Shay! If Your nightshade free flour blend is used as the base, should the xanthum gum be added in the recipe or no? AND… if making this recipe as a larger round or sheet cake instead of cupcakes, are there specific modifications that need to be made to the recipe ingredients to keep a moist and full consistency, or is the baking time all that needs to be changed? Hi Aletha! Yes, still add the xanthan gum because my nightshade free blend doesn’t have it already in it. I haven’t personally tried this as a cake yet but Sarah (above) has. She doubled hers but you probably don’t need to and bake it in 2 8-inch pans – I can’t tell you for certain though without actually trying it myself. I’m so glad that you enjoyed these! Thank you for your feedback on these too. It’s always so nice to hear when people make these recipes! If I use the Bob’s Red Mill 1-for-1 flour, do I still need to add the xanthan gum? I made these with the Bob’s Red Mill flour then continued with the recipe…they were horrible. Thanks! No, if the flour blend you use contains xanthan gum (like Bob’s Red Mill 1:1), omit the xanthan gum called for in the recipe. Too much xanthan gum will make these super gummy/rubbery.